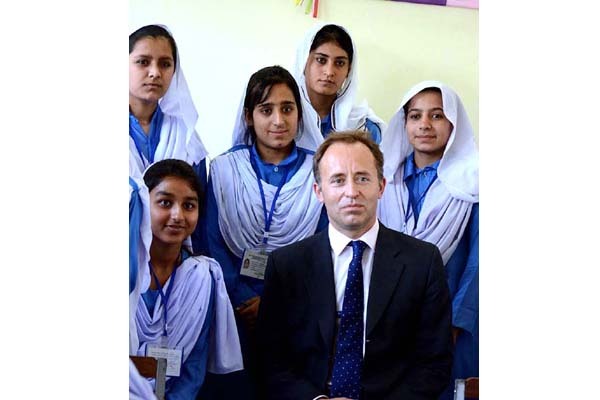 ISLAMABAD, May 27 (APP): British High Commissioner to Pakistan, Thomas Drew CMG, visited Mardan where he toured two schools and a Basic Health Unit. The schools are being supported through the UK’s education sector programme in Khyber Pakhtunkhwa, a press release issued by the British High Commission here on Friday said. The programme comprises both financial support to the Elementary and Secondary Education Department in the Government of Khyber Pakhtunkhwa and a school reconstruction and rehabilitation programme carried out by an international construction firm, IMC. The boys’ Government Higher Secondary School in Mayar has been revamped by IMC to include 13 classrooms, new offices for the Principal and for administration, and a new toilet block with 11 washrooms, including one for children with disabilities. The girls’ Government Higher Secondary School in Par Hoti will have 19 new classrooms which will allow many more girls to attend school. When fully functional, the two schools will help educate more than 2,100 students, including 1,260 girls. The High Commissioner also visited the Basic Health Unit in Sheikh Maltoon, supported by UK aid. The unit provides basic out-patient and preventive health services, including nutrition, family planning and routine immunization for under-privileged local communities in the area. He met a community group that plays an important role in helping services to better reflect local needs. The British High Commissioner met the Provincial Minister of Education, Muhammad Atif Khan and the Provincial Health Minister, Shahram Khan Tarakai, and discussed provincial public service priorities and the UK’s on-going support programmes in the education and health sectors. Talking about his second visit to Khyber Pakhtunkhwa in two weeks, the British High Commissioner Thomas Drew said: “I was delighted to visit Mardan today to see for myself how the UK is working with local schools and healthcare providers to improve education and health in the province. I was able to discuss with the Provincial Ministers for Education and Health their priorities in these areas and how we work together to maximize the impact of UK aid. “While visiting the two schools, I was able to see for myself how our support for construction work is allowing more young people to go to school and have a better learning environment; and how our support to the Government of Khyber Pakhtunkhwa is improving the quality of teaching and learning. It was a pleasure to meet children who are getting a better education thanks to UK aid, including the boys of the Higher Secondary School in Mayyar and the girls of the Higher Secondary School in Par Hoti.